The 93-room historic Whitney Hotel is set in the city's Central Business District, but New Orleans-style good times aren't far off. The French Quarter, the Mississippi waterfront, and the Warehouse/Arts district, burgeoning with new restaurants and galleries, are all a short stroll from the hotel's front doors. Superlative service sets the standard: the front desk staff is singled out for rave reviews on TripAdvisor. Rooms come with work desks and ergonomic chairs, and wireless is free everywhere in the hotel. Re-hydrate without sticker shock: you'll find 2 complimentary bottles of artesian water in your room every day. The dining room's tall marble columns and orignal tile and brass add a heritage experience to Creole-influenced dining at Bistreaux at the Bank. The restaurant is open for breakfast, lunch, dinner, and Sunday brunch. Up to 24 guests can be accomodated in the meeting room, with Creole-cuisine catered—or served in a private dining room in an original bank vault—by Bistreaux at the Bank. 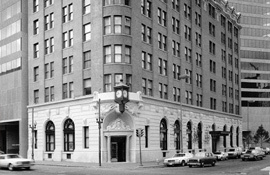 The Whitney Hotel is 25 minutes by car from Louis Armstrong New Orleans International Airport, and a 15 minute walk from Jackson Square in the heart of the French Quarter. Reservations must be cancelled 72 hours prior to arrival to avoid a penalty of one night room and tax, except special events. Your credit card may be authorized for one night room and tax 72 hours prior to arrival. Changes are allowed without penalty. Special Event Policy: For reservations over high-demand periods such as Mardi Gras, French Quarter Fest, Jazz Fest, Essence Festival, Voodoo Festival, New Year's Eve, etc., non-refundable first night room and tax due at the time of booking. Remaining balance due 30 days prior to arrival. All deposits are non-refundable once paid. Host your next business or social event at this historic landmark hotel and treat your guests to an unforgettable setting with a convenient downtown location. Its beautiful lobby restaurant, Bistreaux at the Bank, is a unique venue whose traditional charm is nicely balanced by state-of-the-art equipment, audio-visual support, and quick internet connections. And, with the Commerce Room, intimate gatherings of up to 15 people in a conference-style setup are The Whitney Hotel's specialty.